Where the hell was I yesterday? Abandoning you, obviously. I’m sorry. My heart and mind were elsewhere. Consumed with jamming and puppy play time. I didn’t mean to ignore you, I swear. It was a marathon canning session. 24 jars. 6 hours. 2 pounds of jalapenos. 8 pints of strawberries. 1 pound of tamarind in their lovely, crunchy pods. 3 adorable weck canning jars. Unknown pounds of sugar. 2 doodles (labradoodle, woodle; translation: Bertie (labrador, poodle mix) + Walnut (wheaten terrier, poodle mix). I could barely stand when I got home. Though that’s possibly because I was weighed down with jars, a yelping puppy and a few too many shots of jam cocktails. Because that’s what brilliant ladies like me and my jam partner in crime @jamsofthenest decided to do with our overflow jars of jam. I think any self-respecting jam maker on hour 6 in the kitchen would agree: BEST USE of EXTRA JAM EVER. We kicked off the day with some lovely fried eggs, toast, coffee and dog biscuits. Because one cannot live on jam alone! The dog biscuits, of course, went to the dogs. They relished their new found romance + open backyard to run around in + multiple treats from completely enamored owners. Jam #1: Jalapeno Pepper Jelly. But, of course, we can’t go traditional. That would be boring. So we added red bell pepper for color, orange zest for flavor, and (just for kicks) a few of the smashed tamarind pods. Delightful. Jam #2: Strawberry, Dill, Jalapeno Sauce/Jam. We’re calling it saucy because it’s blended a bit less chunky than traditional jam. Mind you, the dill and jalapeno just make it awesome. Like crazy delicious. And highly recommended with vodka. 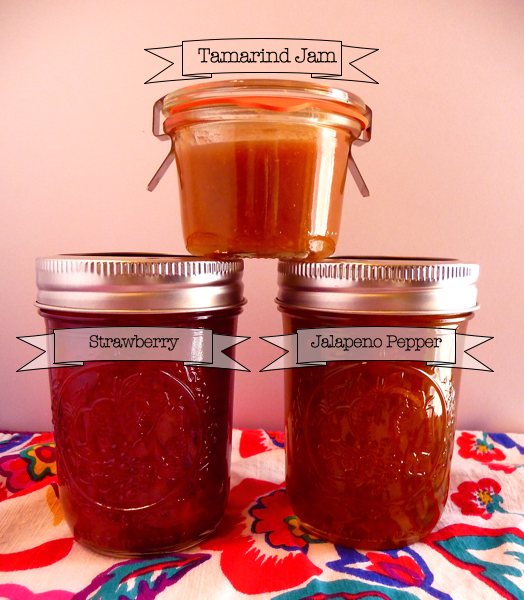 Jam #3: Tamarind Jam. You’ve never heard of this. You barely know what tamarind is. Don’t worry, we’re all in the same boat. I also had never witnessed a pod in person until yesterday morning. Nor did I have any intention of ever making tamarind jam before yesterday in a blurry wander around Whole Foods. I mean, I don’t just wake up and think of these things. But we didn’t just use tamarind in this jam. Oh no! We used cinnamon, ginger, cloves, lemon juice and some secret weapons for this wonder. What does it taste like? Kind of like warm, spicy iced tea in a creamy, oozy spoon full of goodness. It is amazing with whiskey over ice. We invented it. You heard it here first kids. So, if you’re in Hancock Park in the next few days, don’t lie and say “you’re in the neighborhood” and want to come by for a jam cocktail. Because you’re never in Hancock Park. No one is. Except for me. And Daniel. Sometimes Walnut (he, of course, has many other preoccupations). But yes, you can stop in for a jammy cocktail. And we’ll swoon over puppy love and hours spent over boiling pots of sugar, water and fruit. That’s what we’re jamming. sounds like you ladies (and the dogs) had a great time. how fun! Tamarind jam.. like tamarind sauce/paste… which would basically be good in 1/4 of all Thai recipes. I’d dip KFC into tamarind “jam” if available. It’s amazing! My version tastes kind of like a spicy, warm, sweet ice tea. Fried chicken would be amazing dipped in this!